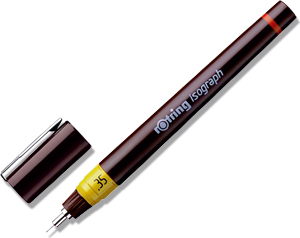 We had to buy Rotring drawing pens for practical classes when I was a Geography student, and I fell in love with my .35 2000 isograph to the extent that I used it all the time, for everything, as my everyday pen. I wrote all my essays with it. I did all my finals exams with it. If I wrote you a letter anytime in the early 1980s I probably wrote it with that pen. I still have that original pen - it has had a hard life and is currently in intensive care, but I hope to get it working again. Meanwhile, my wife bought me a beautiful new set with a .25 a .35 and a .5 ... my "special" pens still!